Da Capo Lifelong Books, 9780738234700, 320pp. 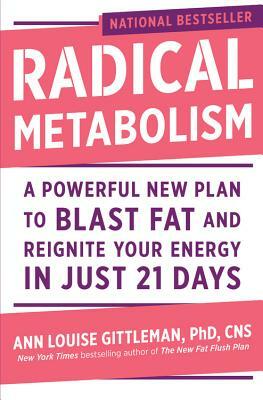 Go beyond Keto and Paleo with Radical Metabolism, which reveals the secrets to reviving a sluggish over-40 metabolism--secrets that work even faster if you're in your 20s and 30s, or you suffer from thyroid issues. No matter your age, if you're a "slow loser" who wants to speed off stubborn pounds and keep those pounds off for good, then this book is for you. Inside Radical Metabolism you'll discover which "forbidden fats," forgotten flavors, and fat-busting beverages you must eat and drink in order to supercharge your metabolism--making weight loss easier than ever before. But weight loss is just the beginning. With this easy-to-follow program you'll also enjoy greater energy, balanced mood, healthier skin, and protection against autoimmunity, gallbladder issues, type II diabetes, and other devastating health problems. With menu plans, 50 sumptuous recipes, an extensive resource section, Radical Metabolism has everything you need to say supercharge your metabolism and transform your body into a fat-burning dynamo in just 21 days. Ann Louise Gittleman holds an MS in Nutrition Education from Columbia University, the title of Certified Nutrition Specialist (CNS) from the American College of Nutrition, and a PhD in Holistic Nutrition. The author of over thirty books (including several New York Times bestsellers), Gittleman has also served as the Chief Nutritionist of Pediatric Clinic at Bellevue Hospital and is the former Director of Nutrition at the Pritikin Longevity Center in Santa Monica, CA. She currently sits on the Advisory Board for the International Institute for Building-Biology & Ecology, the Nutritional Therapy Association, Inc. and Clear Passage, Inc.
"I deeply respect and honor the work of Ann Louise Gittleman, whom I consider as a teacher, as well as what she has done to bring intelligence to the world of nutrition." "Ann Louise Gittleman has been a leading innovator in the field of integrative medicine for decades. Her books bring cutting-edge research to health consumers in an easy-to-understand form. She was one of the first to warn of the dangers of our infatuation with low-carb diets, and now science has validated her message." —Ronald Hoffman, MD, host of "Intelligent Medicine"